There are many reasons why Dr. Moronke Oke is managing the annual colloquium designed to highlight research being conducted by Grand Canyon University faculty. One of those reasons is more near and dear to her heart: She gets to stay in touch with Dr. Kevin McClean, her co-advisor before he retired in 2016. “He’s still just a phone call away, just a text message away,” she said of their sometimes monthly, sometimes weekly, sometimes almost daily communications. “When I say, ‘How does this work, what should happen here?’, he’s always there for us. 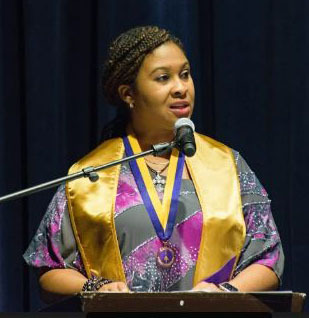 She was able to talk face to face to her mentor Thursday afternoon when the second annual Kevin McClean Research Colloquium, presented by GCU’s Eta Chi chapter of Delta Mu Delta, was staged in Howerton Hall. He liked what he saw and heard. “I was really pleased and impressed with the quality of the research that’s being done, the diversity of the research,” he said. “It’s encouraging to see the level of science that’s coming to the fore. We’ve always had that, but this is a different type and a different level, and I’m really impressed with the way that it’s evolving. GCU adheres to Boyer’s model of scholarship, which goes beyond discovery and extends to application and integration. Both Oke and McClean were pleased that many of the seven presentations were geared toward that concept. Dr. Moronke Oke is thankful McClean is still involved. 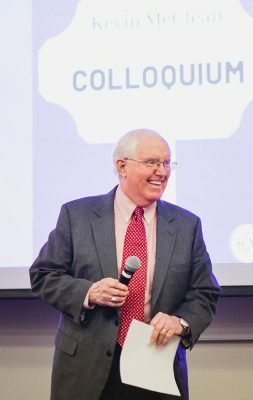 “My biggest message to all of us as a community here at GCU is, when we look at the opportunity to present, we shouldn’t have a constraining factor where we think it has to be empirical work,” Oke said. “It could be about things we’re doing in the classroom to advance our teaching process. 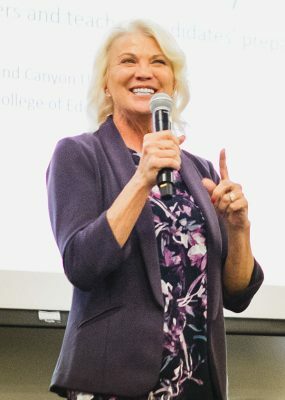 This was a summary of GCU’s creation of Academic Excellence Sites, such as Garcia Elementary in the 2017-18 academic year and Westwood Elementary in 2018-19. (It was featured in the February issue of GCU Magazine.) The goal is to determine whether the program is having a positive effect not only on the pre-service resident teachers from GCU but also on the Westwood faculty. Two figures to note: The College of Education students taught 194 lessons in the fall semester, and some of those Westwood students under their guidance are part of the college class of … get ready for it … 2034. This is another teaching concept that has been featured in GCU Magazine. The cover story of the November issue explained how faith and science interact at the University. “Our mission is to help students focus on their subject matter from the Christian worldview,” Fong said. In surveys handed out from 2014 to 2018 to students preparing for health care and science careers, more than half of the respondents said GCU’s approach helped them articulate the Christian worldview in the context of microbiology. This topic obviously has massive implications, given that an estimated 5 million people in the U.S. have been diagnosed with Alzheimer’s. She is studying whether curcumin, a spice found in plants such as turmeric, can prevent Alzheimer’s disease. Here’s an example of research that still is in the beginning stage. 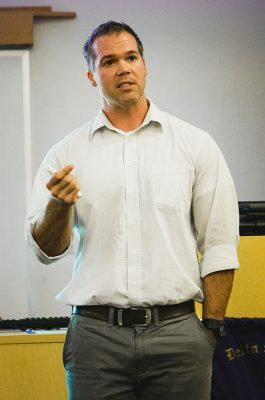 Ruelas, who has volunteered in grassroots and nonprofit organizations that advocate for health education among Latinos, seeks answers to research indicating that Latina women are twice as likely to bottle feed instead of breastfeed even though the latter is considered optimal nutrition. There aren’t many topics that get people’s attention better than weight loss. Zeigler’s research has concluded that weight cycling – watching the scale yo-yo up and down as your eating and exercise habits fluctuate – increases visceral fat accumulation. In other words … “Weight cycling increases your gut. That’s why it’s bad for you,” Zeigler said. He also cited studies showing that 80 to 95 percent of people who lose weight are not able to sustain it. Out of all of Thursday’s presentations, this one affects more people (two billion) than any of them. That’s the number of people in the world affected by tropical diseases, and Mamada aims to find out why new drugs aren’t being developed and why the products that have been developed are being delayed before going on the market. 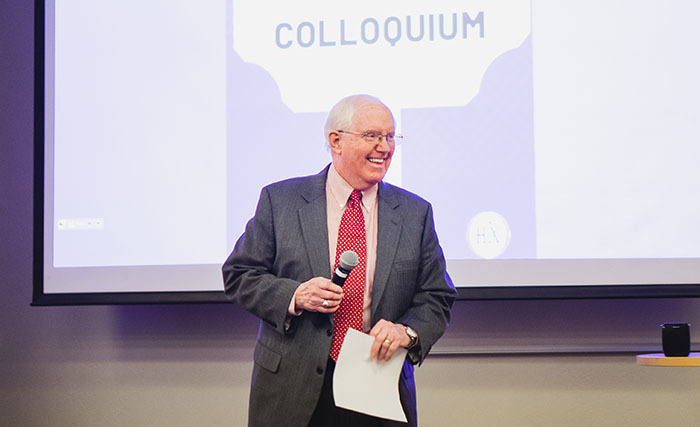 Dr. Randy Gibb, Dean of the Colangelo College of Business (CCOB), emphasized afterward that the colloquium is another example of GCU students – led by Oke and Tracey Lauterborn, in this case – playing a lead role in a major undertaking. The handoff of that torch came from McClean, who started doing the colloquium in 2008. While on campus, he was enthralled by his visit to the new CCOB Building (“Very impressive … it’s just beautiful”), but the growth of the campus excites him just as much. “It’s good that the University is doing so well and the administration is seeing fit to make the facilities really conducive to learning – for the faculty to feel that they have something real nice and, most importantly, that the students have access to them,” he said. Access to a dear professor – and friend – is foremost in Oke’s mind. Was that it, Kevin? Nah … he’s a basketball fan, too. “I came for the New Mexico State game,” he said.